Gabriel performed on show 347, recorded in October 2017, at age 19. 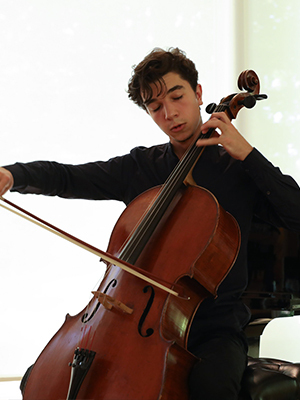 Gabriel Martins (Cello), 19, hails from Indiana and is currently studying at the University of Southern California Thornton School of Music in Los Angeles with Ralph Kirshbaum. He has won the gold medal of the V International David Popper Cello Competition in Hungary, the silver medal of the VIII International Tchaikovsky Competition for Young Musicians in Moscow, and the bronze medal of the 20th Sphinx Competition. He enjoys teaching younger students.